This grilled cauliflower spends less than ten minutes on the grill and is topped with a creamy, delicious sesame aioli. Quick and easy, this is sure to become one of your favorite ways of preparing cauliflower. Place aioli ingredients into food processor. Pulse 10-12 times to mix through. Taste for salt and tahini content and make adjustments. Remove from food processor and store covered in refrigerator until cauliflower has cooked. Preheat grill for high heat. Combine olive oil with oregano, onion powder, sea salt, and black pepper in a small bowl. Remove large thick leaves encasing cauliflower. Wash and pat dry. Apply olive oil mixture all over vegetable. Place onto hot grill and cook for 8-10 minutes, turning 1/4 turn during every 1-2 minutes during cooking process. Watch for burning. Remove from grill and place onto a serving dish. Cut into serving slices and top with the aioli. You can also top with chopped parsley or toasted pine nuts. 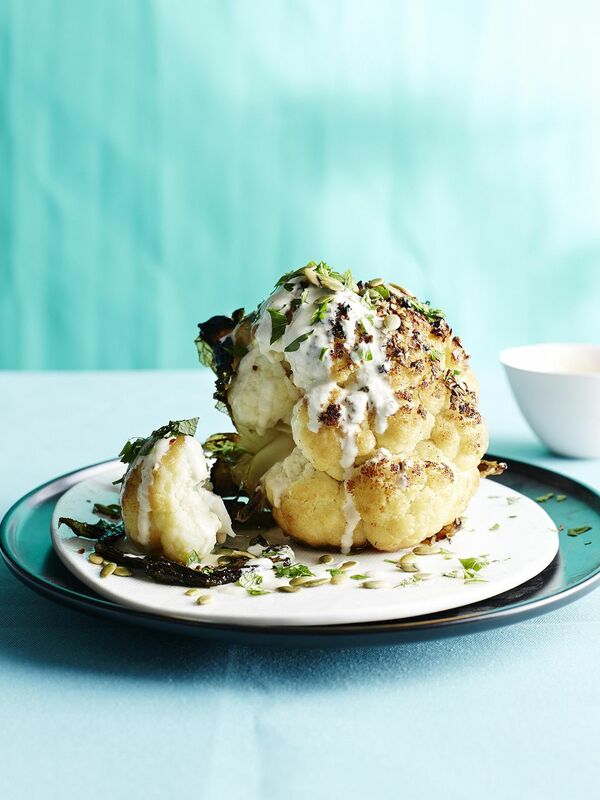 Cauliflower will retain some of its crunch despite being grilled.